More Pink Tiger Lilies, a photo by randubnick on Flickr. 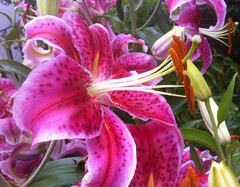 Here are more pink tiger lilies, another photo that I took a couple of days ago. They are so beautiful! I couldn't pass up the chance to photograph them. Pink Tiger Lily, a photo by randubnick on Flickr. 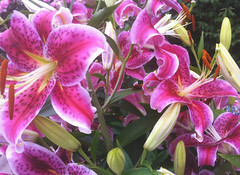 Yesterday while I was out running the usual errands, I saw some bright pink tiger lilies. They were so gorgeous that I couldn't just pass them by, so I took out my iPhone camera and took a couple of pictures. Tonight I cropped this one just a bit to get this composition. Still More Petunias in Lexington, a photo by randubnick on Flickr. This image uses a pattern made that I made a few days ago from one of my photographs. In Painter, you can open an image and "capture" it as a pattern. 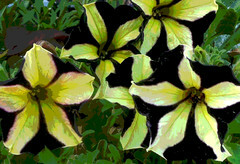 This is a pattern created from a photograph that I took earlier this summer of some unusual petunias that I saw in Lexington, MA. Tonight in Painter I loaded this new pattern into a pattern pen. I used a pink background and a large brush. I only made a few strokes, but I didn't get the placement right at first, so I had several do-overs. Once I had the strokes where I wanted them, I posterized the image at level 6, which is pretty strong. The posterizing creating some interesting stripe effects. The last step was to crop the image to get this composition. Many Petunias, a photo by randubnick on Flickr. Yesterday I used Painter software to "capture" a new pattern. I used a photo that I took in early July of some interesting petunias that I saw in Lexington, MA. (See yesterday's post for a closer look.) After I created the pattern, I wanted to try it out, so I opened a new file and used the paint bucket tool to fill the image with the petunia pattern. I fiddled with the controls until I had the size and offset that I wanted, and then I cropped it to get the image that you see here. 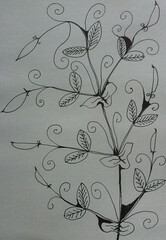 The next step is to use the new pattern with a pattern pen. 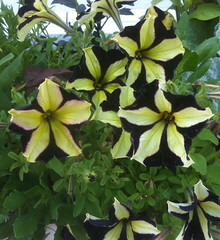 To be continued. . . .
Lexington Petunias for Pattern, a photo by randubnick on Flickr. This image began with a photo that I took in Lexington, Massachusetts, where I passed a planter that contained these unusual yellow and purple petunias. (I posted that photo here on July 7.) Over the past few days, I have been making digital images with Painter's pattern pen, and tonight I decided to create more patterns to use. I do want to have more patterns, but I also need more practice using Painter with iPhoto, which works a little differently since I upgraded. 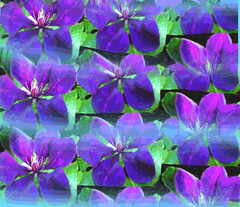 So I went back to the image of petunias, opened it in Painter, and cropped it hard to get this image. Then I posterized the result and captured it to use as a pattern. I also made a basic image with this pattern, and I will post it here tomorrow. Nine White Roses, a photo by randubnick on Flickr. 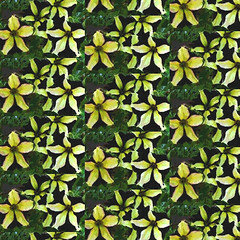 Two days ago, I used Painter's pattern pen to create an image with pattern made from a photo of clematis (taken last summer). I used a process that was a little different from what I usually do with the patterns pen. I liked the result, so I thought I would try another one. This time, I used a purple background, and like last time, used Painter's pattern pen with a soft edge. 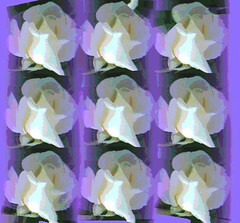 The pattern is white roses, which I captured from one of my photos last year. I used a very large brush and made just a few strokes (though it took a lot of trial and error to get things where I wanted them). Then I posterized the result and cropped it to get this composition. Stopping for the Train, a photo by randubnick on Flickr. This morning I took a short walk between projects, just to have a quick break. As I came around the corner, the railroad crossing lights started flashing because the train was pulling into the station. The barrier came down across the sidewalk, so my walk would have to stop for the train, for a few minutes at least. But this was a great opportunity to photograph the train, so I decided to stop and look at the train as well. 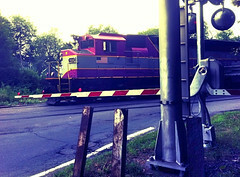 I pulled out my iPhone and got ready for the train to pass, and as it left the station, I got a few photographs. This is one of the best. While this photo was still in the iPhone, I used the Camera Bag app to apply the Colorcross effect. Then I transferred the image into my computer and used iPhoto to crop the original to get this composition. 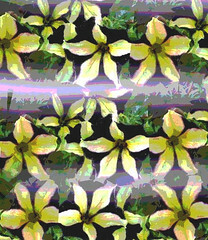 Clematis Pattern (Posterized), a photo by randubnick on Flickr. This is digital image that I made tonight in Painter. I used a pattern pen and a clematis pattern that I created from a photo last summer. I used the pattern with transparent edges over a blue background. Then I posterized the result and cropped it to get this image. 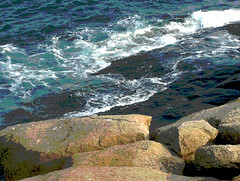 Ocean and Rocks (Posterized Photo), a photo by randubnick on Flickr. This image began with a photo that I took a few days ago near the ocean in York, Maine. We were visiting some friends we have known since we were neighbors back in Chicago in the 1970s. Now they are in Maine for the summer. It was great to see them! Before dinner, we went to see York Beach, near the Nubble lighthouse where we sat and talked and admired the spectacular view. 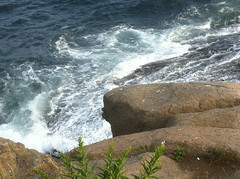 The coast is very rocky there and seen from above, the ocean looks blue-black. Tonight I opened the original photo in Painter, cropped it, and then posterized it to get this image. Looking at the Waves in York, Maine, a photo by randubnick on Flickr. Yesterday's adventure was a drive to York, Maine, for dinner with old friends. It was a very hot day, but we drove to the coast, and it was a little bit chilly there. Of course, I was taking pictures. I liked the view looking down at the inky water and the lacy foam. Quartet, a photo by randubnick on Flickr. Today started with a birthday breakfast at a local diner in a little strip mall with big rose bushes planted outside. Of course, I took some pictures. Don't these roses look like they belong on a birthday cake? 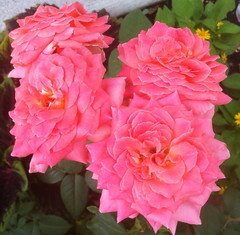 I decided to post this little quartet of roses in honor of four family birthdays on July 21 and 22. Evening Reflections at the Pond, a photo by randubnick on Flickr. 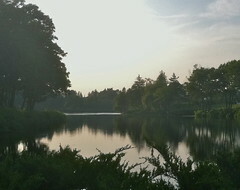 Here's another evening photograph, this one from yesterday's after dinner walk at the Cummings Center Pond here in Beverly, MA. The light was fading but the reflections on the pond were beautiful. It is great to cool off with an evening walk after a hot day. What is even better is to enjoy the peaceful scene when life is hectic. And when life gets so busy that I don't think I can take time for a walk, that is precisely when I need to get out and look at nature. And I take pictures when I love what I see, and so I try to capture the scene (and the sense of peace that it brings me) in a photograph. Another Summer Sky, a photo by randubnick on Flickr. Here is another photograph of another sunset. 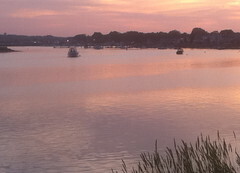 This is cropped from a photo that I took during a walk last night at Obear Park here in Beverly, MA. Sunset with Clouds, a photo by randubnick on Flickr. It has been hot here, and an evening walk near the water is a great way to cool off. And it is also the best way to take a dog for a walk, because dogs are allowed in waterfront parks after 7:30. This is a photo that I took last week during a walk at Obear Park in Beverly's Ryal Side neighborhood. It is one of the few places where you can get a good view of the western sky, so it is great for sunsets. Although I go there quite often, I don't get tired of it and I always keep my camera ready, because the sky is different every time. Picking Peas (Digital Woodcut), a photo by randubnick on Flickr. This image started with a pen-and-ink drawing of peas on the vine that I created earlier in the week, inspired by a trip to the Food Project where I picked peas in the field. I liked the drawing but still wanted to make some changes, so yesterday I used Painter's digital pastel to revise the drawing electronically. I published the result here last night. But I also decided to see what would happen if I used my Painter software to apply the "digital woodcut" effect to my (revised) drawing. I really liked the result, so here it is. Picking Peas (Perfect), a photo by randubnick on Flickr. This is a pen-and-ink drawing that has been digitally modified. I decided to go back to the drawing of peas on the vine that I posted two days ago. I liked the idea and the lines, but decided to eliminate some of the darker areas in the drawing. Although I have re-done plenty of pen and ink drawings in the past, I didn't really want to start over because I knew I would risk losing the spontaneity of the lines, so I decided to see what I could do on the computer. I opened the jpeg of the drawing in my Painter program, made a copy, and used digital pastel to cover up some of the dark areas. I and used a soft grainy "digital pastel" to try to reproduce the look of the paper. Well, these peas are not really perfect, but I am happier with this version because it emphasizes the lines. After I was all finished, I decided to try one more thing: adding a digital woodcut effect. I was pleasantly surprised at the result, which I plan to post here tomorrow. Peas at Long Hill (Posterized Photo), a photo by randubnick on Flickr. 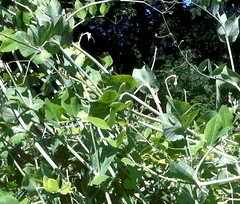 Here are the peas that inspired the little pen and ink drawing that I posted yesterday. This is a posterized version of a photo that I took with my iPhone camera while I was supposed to be picking peas. (This was at the Food Project here in Beverly, MA, out at Long Hill Gardens.) Tonight I used Painter to crop and posterized the photo. When I tranferred the image back into iPhoto, I cropped it one more time to get a close-up view of the gentle vines and friendly tendrils. Picking Peas, a photo by randubnick on Flickr. Today's adventure was going to Long Hill Gardens to the Food Project. This is Community Supported Agriculture and on Thursdays, members go and retrieve their weekly haul of organic vegetables. And it was my turn to go out to the field and pick peas (two pints, one pint for me and one for my daughter). Well, it is almost the end of the season for peas, so it took a while to find enough. But I confess here that it would have taken me a few minutes less time had I not stopped to take some quick pictures. Anyway, with all that time spent looking for peas, I was also looking AT peas. I love the gentle leaves and the beautiful tendrils. After dinner, I grabbed a sketch book and a pen and started drawing, mostly from memory and imagination, though I looked at the photos I had taken for reference. Although the pen was a bit leaky and the sketch isn't perfect, there's something about it that I like. Maybe I will go back and re-do it sometime, but meanwhile it made me happy to pick those peas, and happy to draw them afterward, so I am posting my sketch here tonight . Tomorrow I will post one of the photos that I took in the field (while I was supposed to be picking those peas). Cone Flowers, a photo by randubnick on Flickr. There was a break in the hot weather this afternoon. (Rain was on the way.) We took advantage of the cooler weather to take the dog for a walk at the Cummings Center Pond (here in Beverly, MA). Lots of flowers were in bloom, so I took a few pictures with my iPhone camera. 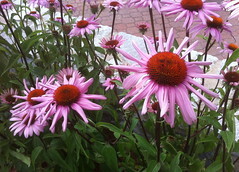 The cone flowers (aka echinacea) were great, and I liked the way they looked against the stone edging and brick sidewalk in the background. Apart from a very minor amount of cropping in iPhoto, this is the photograph just as it came out of the camera. Evening at Manchester-by-the-Sea (Posterized Photo), a photo by randubnick on Flickr. 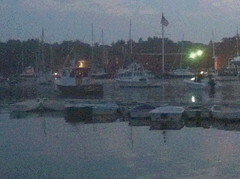 This is another of the photos that I took last night at Manchester-by-the Sea (Massachusetts). It was a short stop to see the boats, but it was nearly dark and the bugs were biting. We didn't stay long because we were being eaten alive, but I did have a chance to take a few photos, and this is one of them. I was interested in the boats lined up in the water and the green light in the background. When I got the image into my computer, I could see it was grainy and too dark, so I opened it in Painter, adjusted the exposure a bit, and then posterized it. 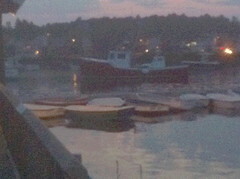 Boats at Manchester-by-the-Sea (PSTR), a photo by randubnick on Flickr. This image started with a photograph that I took this evening at Manchester-by-the Sea, We took a ride up the coast and thought we would stop, admire the view, and walk around. The view was beautiful, but all our phone cams were running on low battery. Besides, our adventure was cut short because we were being eaten alive by mosquitos who were also out enjoying the sunset. So I had time to take four pictures, and this is the best one. But when I got it into the computer, I could see that it was grainy because of the low light. So I opened the image in Painter and tried posterizing it. I liked the result, and here it is. 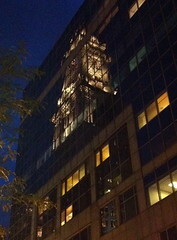 Reflected View of Custom House Tower, a photo by randubnick on Flickr. This is a photograph that I took tonight in Boston. We had a day full of adventures with our visitors. (We went to Cambridge bookstores, had Italian pastry in the North End, and ate dinner on Long Wharf.) We were walking back to the car. Boston's Custom House Tower looked great in the night sky, but at that point, I wasn't planning to take any more pictures. The power in my phone was so low that it wouldn't even turn on. But one of our visitors is a great photographer and he pointed out this view of the clock tower reflected in the glass of a nearby skyscraper. I couldn't pass up this shot, so I used a borrowed iPhone to take some pictures, and then e-mailed the images to myself. This one is the best of the bunch. Once I had it in my computer, I used iPhoto to crop it to improve the composition. Stop and Look at Boston (Posterized Photo), a photo by randubnick on Flickr. This image began with a photo that I took this evening in Boston. Two friends were arriving at Logan on flights several hours apart, so we had time between airport runs to see a little bit of Boston and get something to eat near Quincy Market. On the way back to the airport for the second pick-up, I was in the passenger seat, navigating. We stopped at a red light, and my concerns about getting lost or being late vanished when I looked up and saw this view. 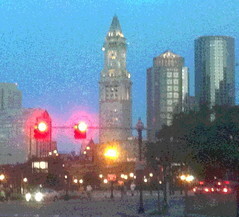 Then I was glad for the red light because it gave me a chance to stop and look at Boston. Later, when I got the image into my computer, I could see that the light was too low and the focus was a little too soft. So I opened the image in Painter and posterized it. 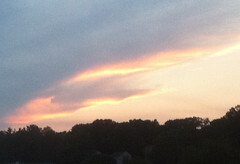 Then I used iPhoto to crop the image, and this is the result. Pink Light on the Water, a photo by randubnick on Flickr. 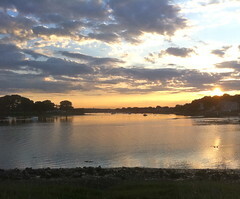 This is a photograph that I took last night during another evening walk at Obear Park, here in Beverly, MA. I wasn't planning to take pictures. (I have taken so many!) But the light started to change and the water turned an iridescent pink, and I saw no point in resisting, so I took out my iPhone camera and took a few photos after all. Tonight I used iPhoto to crop this one just a little bit. Petunias in Lexington, a photo by randubnick on Flickr. This is a photograph that I took today while I was walking around downtown Lexington, MA. I found myself face-to-face with these petunias, so I took a picture with my iPhone camera. Tonight I used iPhoto to crop the original version to get this composition. 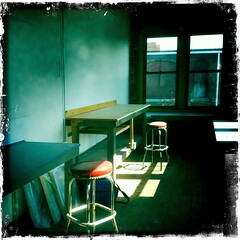 Moving in to New Studio, a photo by randubnick on Flickr. Peaceful View from Obear Park, a photo by randubnick on Flickr. 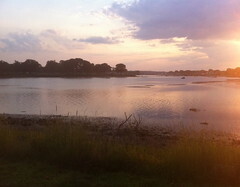 This is a photo that I took tonight with my iPhone during an after dinner walk at Obear Park, here in Beverly, MA. You can take a dog to the park after 7:30, and it is nice and cool. Everybody has been heading to the beaches and parks here to see the fireworks for July 4th. (Even now, I can hear fireworks through my upstairs window.) But it was peaceful tonight in the park, with a view to match. Fourth of July a video by randubnick on Flickr. Today I used the Brushes app on my iPad to create this little video for the Fourth of July. Dappled Light at Horn Pond (Posterized Photo), a photo by randubnick on Flickr. Yesterday's image was a photo that I took at Horn Pond in Woburn, MA. Tonight I used Painter to create this posterized version of the same image because thought it would be interesting to apply the posterizing effect to dappled light. So here it is. Dappled Light at Horn Pond, a photo by randubnick on Flickr. This is a photograph that I took a couple of days ago at Horn Pond, in Woburn, MA. We were in Woburn to take our dog to the vet, so we added a little side trip to see the pond. 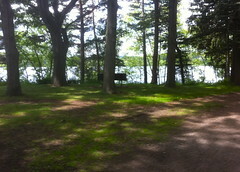 I liked the contrast of the dappled light under the trees and the sunlight on the water in the distance. I only had time to get a couple of quick pictures, but I am happy with this one. Daylilies in Wellesley Hills (Digital Woodcut), a photo by randubnick on Flickr. This is a digital woodcut that I made using Painter last night. 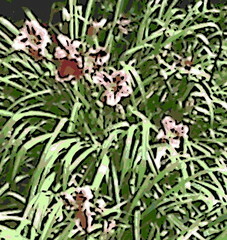 I made it from the photo of daylilies that I took at Wellesley Hills yesterday. What I like about the woodcut effect is the way it emphasizes the lines of the leaves.